100% COTTON, HIGH QUALITY HANES TAGLESS, SHORT SLEEVE SHIRT. 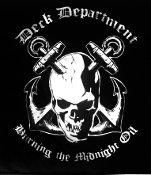 FEATURING DECK DEPARTMENT GRAPHIC INCLUDING SKULL AND CROSSED-ANCHORS ON THE BACK AND CROSSED ANCHORS ON THE FRONT LEFT. CLICK ON PHOTO FOR ENLARGED VIEW!